Medical malpractice cases range from simple diagnostic errors to serious ones, like permanent injuries or in worst cases, death. It is important that a person is aware of the types of medical malpractice and plausibility of claims associated with them. 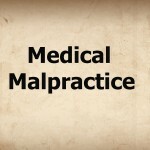 The most common types of medical malpractice are cosmetic surgery errors, wrong prescription drugs, birth injuries, diagnostic errors and surgical errors. In United States, there has been a tremendous increase in cosmetic surgery procedures which are mostly not covered by health care insurance. Compensatory and punitive damages are deserved in case of cosmetic surgery medical malpractices. However, these claims have a comparatively low success rate. Prescription drug errors are a common form of medical malpractice errors. These errors are detected depending upon the severity of harm caused, and if serious, a claim can be made. Doctors, healthcare staff, pharmacists and prescription drug companies are liable for the harm caused. The mistakes can be prescribing or administering wrong medication or dosage, manufacturing defective medications, etc. If the baby or mother is harmed in any way before or during the birth process due to below standard care by a medical professional, a birth injury medical malpractice claim exists. Cerebral palsy, brain damage, fetal death etc. are some of the cases. Other factors like incorrect use of forceps or vacuum, inadequate baby monitoring etc can also result in injuries. It is imperative to prove that the injury is caused because of unreasonable actions of the healthcare providers. Diagnostic errors can be misdiagnosis and late diagnosis. A diagnostic error claim exists if the patient is harmed due to the doctor’s untimely and inaccurate diagnosis. Then there are surgical errors cases that arise when an accidental damage has been caused to the patient’s internal organ, blood vessel or other body part during a surgery.